Now that Penguin Adventure is done, we have decided to take the last month of the year to port Gradius for the ColecoVision Super Game Module. That way we could concentrate on the two arcade ports next year. The SGM version of Gradius is based on the MSX version, which is quite good. However the SGM version will receive a complete makeover to make it look more like the arcade original. So for example, check the screenshots to see a before/after comparison of stage 2. About 50% of the code has been ported, and the visual makeover will start after we get the game fully ported and running. 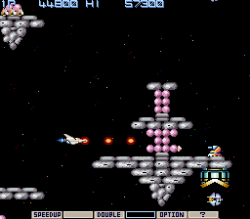 Gradius is an absolutely stellar game! Loved it in the arcade and on the NES. So looking forward to playing a ColecoVision version! I agree, Gradius is fantastic, and in fact my all time favorite shooting series. 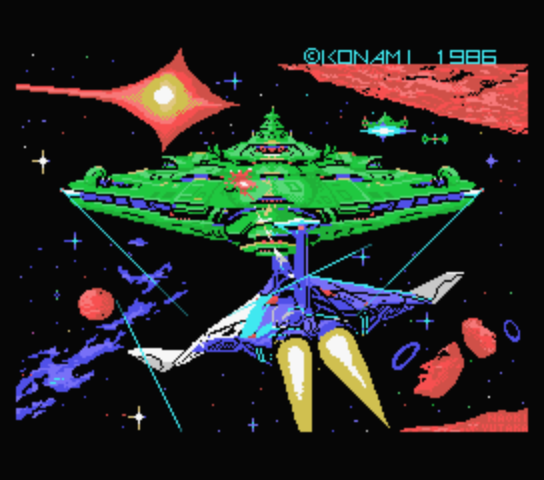 Even though the NES offers superior hardware overall, this version of Gradius has a few advantages, like a number of small details missing in the NES port, an extra stage not found anywhere else, four hidden bonus stages and more. In addition to that the CV port will offer closer to the arcade graphics, an easy mode, and overall performance improvements. Wow! 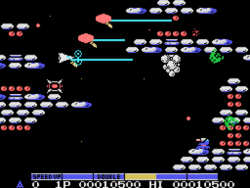 Penguin Adventure and Gradius...I feel faint!!! Gradius is one of my all-time favorite games. A game that can detect F18a and then run in an enhanced mode would be awesome!!!!! Gradius port is progressing nicely. 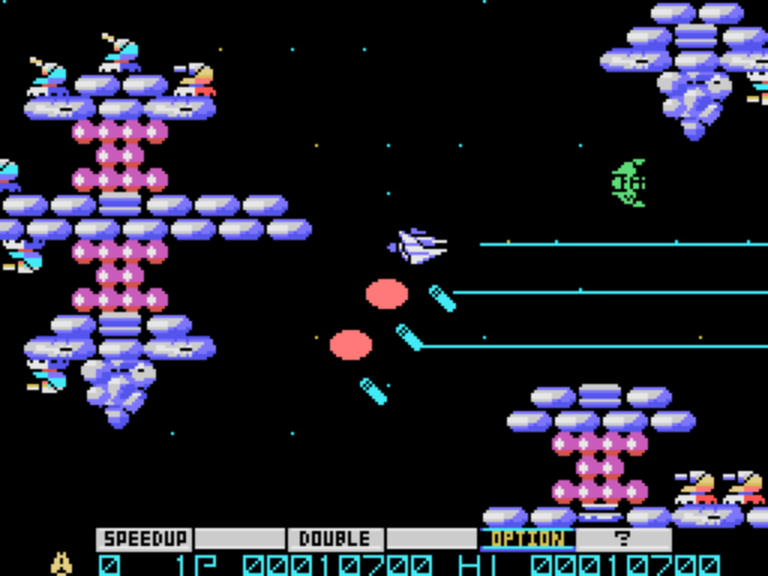 The green enemy is from the arcade version but was missing in the MSX version. That oversight has been corrected in the ColecoVision version. Never played the game but it looks like it is fun. Reminds me of silpheed but side view. Totally awesome!! Love the true arcade sounds and gameplay. Played lots of hours on the NES and on the arcade machine, and it's a great game! Fantastic! The NES version is one of my all time favorite shooters and this looks great! And with the F18A via RGB this should look incredible on the CV! Great work! My first time playing Gradius was a bonus game in Mystical Ninja for the SNES. It only contains the first stage. 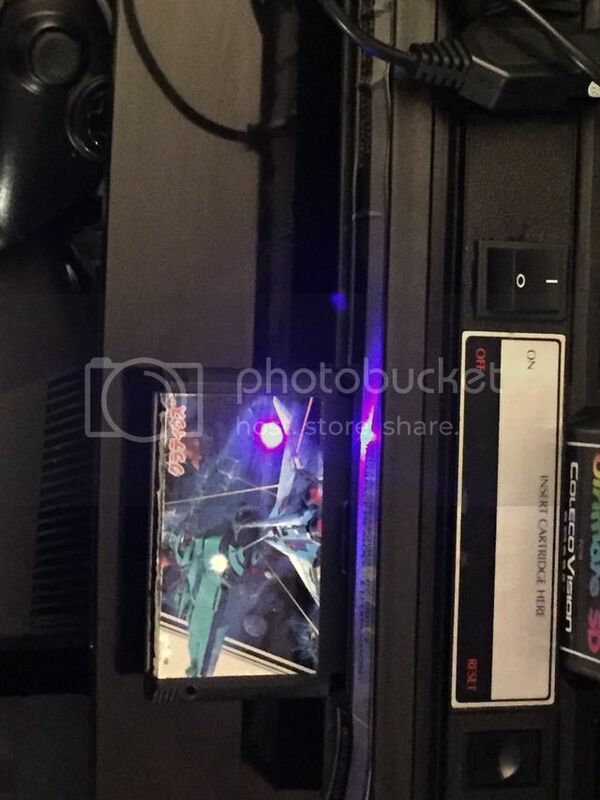 And the MSX at a museum that doing a special exhibit on old consoles had Gradius in it. That opening music and the 1st stage music burned in to my mind. I'm definitely going for this version for the Colecovision when it is finished. Did it revert to the "before" look, or has the "after" look of Post #1 not started coding yet? 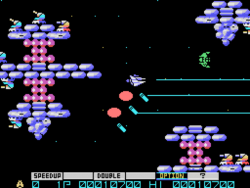 In my first post, the screenshot to the left is the "after", while the screenshot to the right is the "before", that is how the game looks on the MSX. I am posting here a screenshot from the same stage in the arcade version, so you can compare. But we aren't just changing the graphics. In some cases I am adding back some missing elements from the arcade version too. 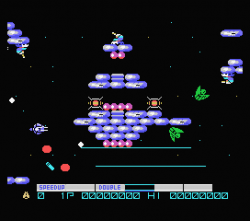 For example, in the video you will see a flying green enemy. That enemy is exclusive to stage 2 (the stage shown in the video) but was missing in the MSX version, being replaced by the generic green enemy you see in my first post, which appears in all stages but stage 2 in the arcade version. Hey, guys. I hope you had a great holiday. Opcode Games wishes you a very happy NEW YEAR with many games and lots of fun! AAAANND to celebrate the beginning of this awesome new year, I have the pleasure to announce that in a few hours you will be receiving a long awaited news in your email box. STAY TUNEEEEDD!! !